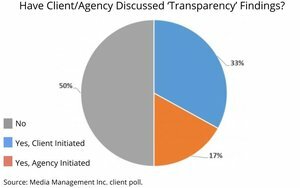 In the months since media-buying “transparency” has become a flashpoint between advertisers and agencies, half of all clients say there has been no communication with their agencies over the subject. Among the half that have discussed the issue, clients have initiated those conversations by a margin of two-to-one of their agencies. Those are the findings of a “quick poll” conducted among its clients by media-buying auditing firm Media Management Inc. (MMI). The findings, which are being released today on the opening day of the Association of National Advertisers’ annual Masters of Marketing conference in Orlando, are likely to be more fuel for what has proven to be the ad industry firestorm of 2016. Asked how “aware” they were of the ANA’s transparency study as well as its recommendations for fixing issues revealed by it, the vast majority (83%) of MMI’s clients said they were either “very” or “somewhat” aware of it. In a blog post unveiling the findings, MMI said the fact that only half of clients have had any communication with their agencies about the issues is the most important issue. The biggest individual concern, cited by 21% of respondents, was “undisclosed/non-returned rebates” paid to agencies by media suppliers, followed by “transparency issues in digital media” (20%), and “principal-based agency buying activities” (3%). Asked what action they have or plan to take, 71% of respondents indicated that they have either discussed or taken action to date, while more than a third said that they have either retained a third-party expert or have already made changes to agency contracts and other agreements. Only 9% of respondents indicated that they have not taken action to date, and do not intend to do so within the next six months. The findings are based on completed surveys from 36 of 123 MMI clients invited to participate. They surveys were completed during the week of October 10.